In Sikh history Mata Sahib Kaur is known as the Mother of the Khalsa. This honour was bestowed upon her by the Tenth Nanak, Guru Gobind Singh Ji. When a Sikh receives the gift of Khande Dee Pauhul (Amrit), he/she is told that from today onward your father is Guru Gobind Singh Ji and you mother is Mata Sahib Kaur Ji.Mata Sahib Kaur Ji, whose name before taking Amrit was Mata Sahib Devan Ji, was born on the 1st November 1681 in a village called Rohtas, District Jehlum, in West Panjab, (now in Pakistan). Her mother’s name was Mata Jasdevi Ji and father’s name was Bhai Rama Ji. Her father, who was an ardent sewak (devotee) of Guru Gobind Singh Ji, influenced her to the extent that she wanted to devote her whole life in the service of the Guru Sahib. From her childhood, Mata Sahib Kaur Ji was a sweet and quiet natured girl. Because of the religious atmosphere at home, she was deeply influenced by Gurbaani during her formative years. It is possible that in her childhood she might have seen Guru Gobind Singh Ji at Sri Anandpur Sahib during the visit of her family. "...She had inherited humility, love and sacrifice to humanity and devotion to Waheguru..."
When she came of age, her father and other devotees of village Rohtas, took her to Sri Anandpur Sahib and requested Guru Gobind Singh Ji to take her as his bride. Guru Ji told the Sangat that he was already married and could not marry again. However, Mata Sahib Kaur Ji's father had pledged his daughter to Guru Sahib and no-one else would marry her now. Therefore, Guru Sahib agreed that Mata Sahib Kaur Ji could stay with the Guru's family, however, they could not marry or ever have children. Guru Sahib instead promised Mata Sahib Kaur Ji, that you will become a great Mother to thousands. Mata Sahib Kaur Ji lived in the Guru's household and served Guru Ji and the Sangat with full shardaa (devotion). 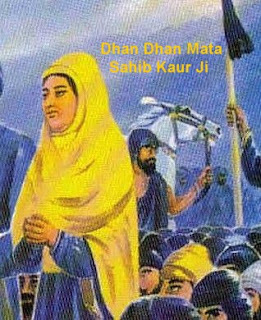 Mata Sahib Kaur Ji accompanied Guru Sahib throughout his life, even during battles, serving him in every possible way. On Vaisakhi 1699, in the first Amrit-Sanchaar, Mata Sahib Kaur Ji participated in the sewa of the Amrit-Sanchaar by adding Pataasey (sugar wafers) to the Amrit, and was bestowed the honour of eternal motherhood of Khalsa Panth. When Guru Gobind Singh reached Abchal Nagar (Sri Hazoor Sahib), he sent Mata Sahib Kaur Ji to Delhi and gave her five weapons of the Sixth Nanak, Guru Hargobind Sahib Ji, for safekeeping. These weapons are today displayed at Gurdwara Rakabganj in Delhi. Mata Sahib Kaur Ji, passed away before Mata Sundri Ji. She left for heavenly abode at the age of sixty six in 1747 and her last rites were performed in Bala Sahib, Delhi. You are wrong if you think I had only four sons, I have thousands of sons and daughters and in them I see the four I sacrificed. 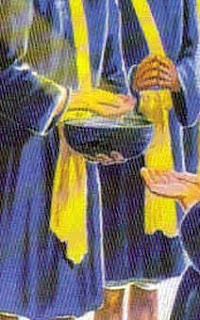 Those four sons were four virtues from Waheguru Ji, their body pots were to be smashed so that those virtues could be poured into the Khalsa. Ajit means unconquerable, my Khalsa would rather die fighting than run like a coward. Jujhar means warrior, my Khalsa is powerful and strong. Zorawar means Power, as long as my Khalsa is distinct I will give them all of my power. Fateh is victory, my Khalsa will fight for Waheguru's victory.O Mata Jee, when I see one Khalsa with these 4 qualities I see all four sons.